Native to Asia, Europe, North Africa, and the Indian subcontinent. Introduced and naturalized in North America. This is a 1′ to 8′ tall, erect, freely branching, biennial forb with a strong taproot. The stems are light green and hairless. The taller plants tend to be bushy, the shorter plants lanky. In the first year they are small and do not flower. In the second year they are taller, bushy, and produce many flower clusters. The compound leaves are alternate, hairless and divided into three leaflets.The leaflets are oblanceolate or obovate, ½″ to 1″ long and up to ¼″ wide. They are grayish-green, finely toothed along the middle and upper margins, the teeth pointed outward rather than forward. The middle leaflet is on a distinct stalk. The inflorescence is many tall, spike-like clusters of stalked flowers. The clusters are on elongated stems produced in the axils of the middle and upper leaves. The flowering stems are 2″ to 6″ long. Dozens of small flowers are crowded along the top two thirds of the stem. 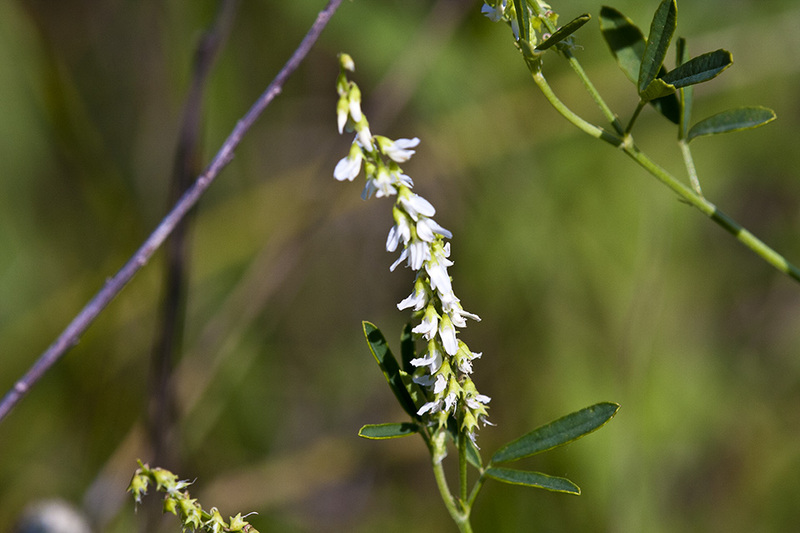 The flowers are ⅛″ to ⅓″ long and are attached to the stem with a minute stalk. They droop down but ascend at the tip. Yellow sweet clover (Melilotus officinalis) has yellow flowers. 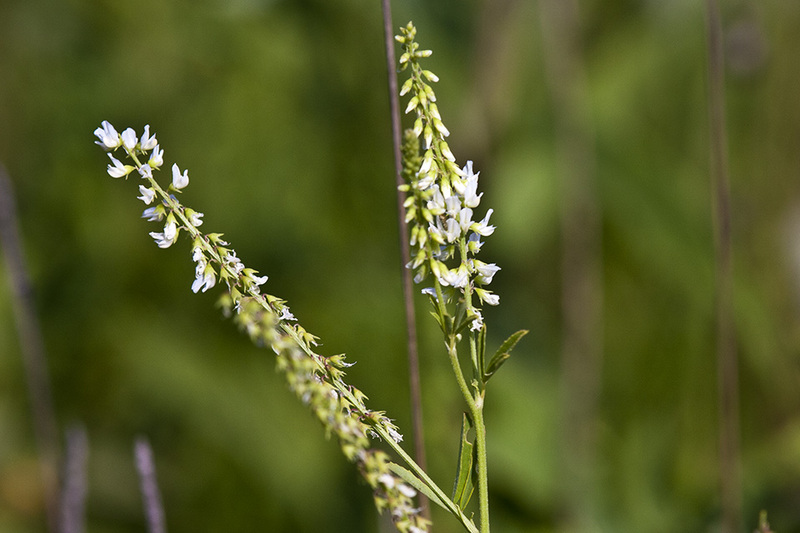 It is usually a little shorter than white sweet clover. The foliage is plain green, not grayish-green. 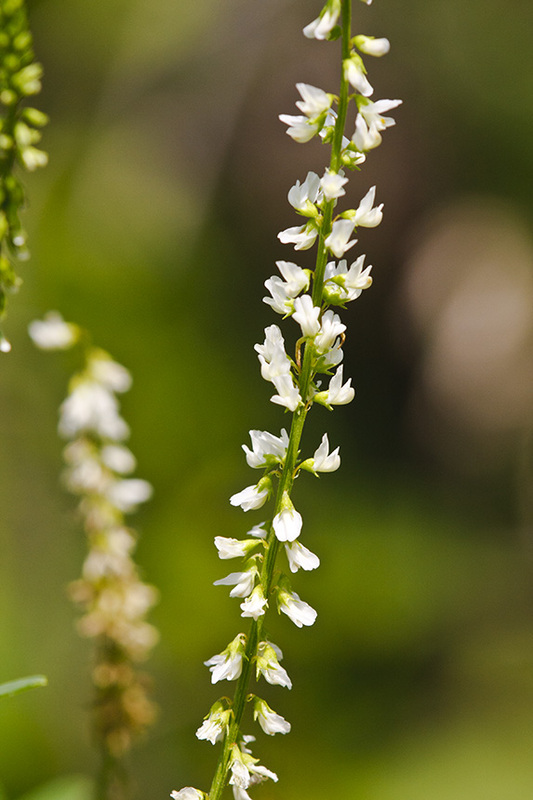 It blooms 2 to 3 weeks earlier than white sweet clover. Distribution Sources: 4, 5, 7, 22. 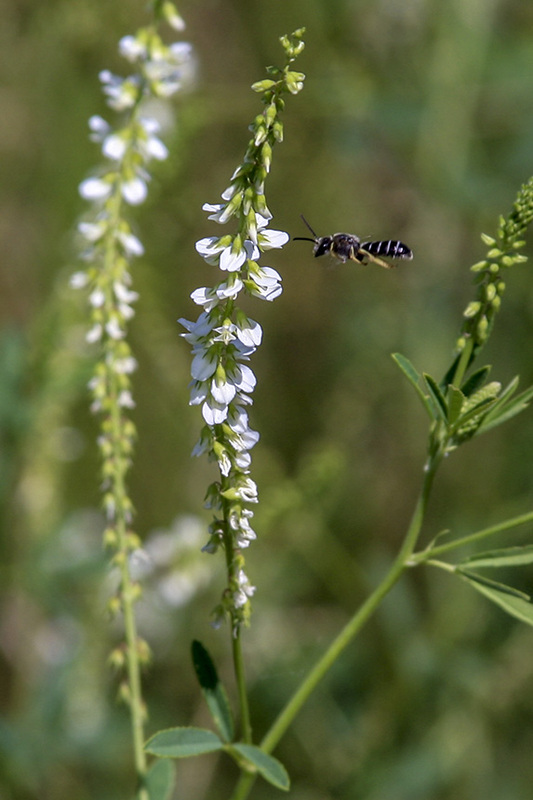 Some authorities consider white sweet clover and yellow sweet clover (Melilotus officinalis) the same species with differently colored flowers. Most authorities, including Gleason & Cronquist (1991) and Mohlenbrock (2002), treat it as a separate species. A leaf that is divided into leaflets, each leaflet having the general appearance of a leaf, with all leaflets attached to a single leaf stem. Reverse egg-shaped, with the attachment at the narrower end. Farmers will plant this in rotation in their fields to replenish the nitrogen in the soil. 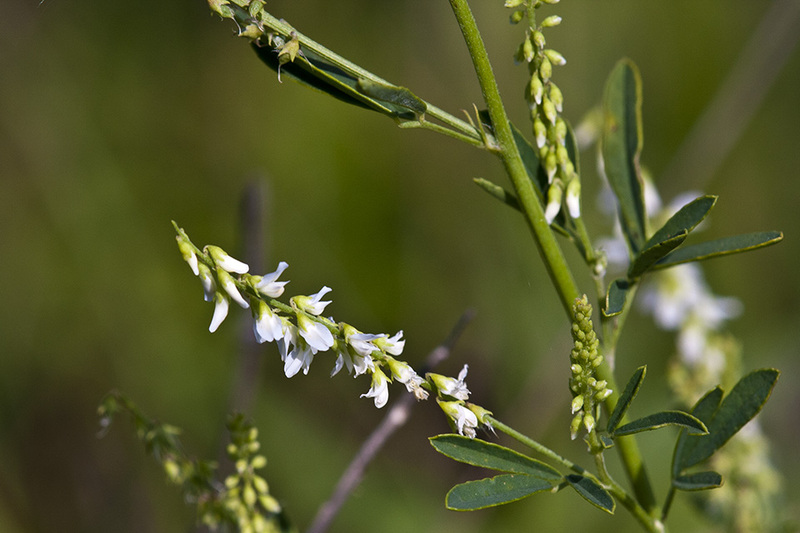 White Sweet-Clover (Melilotus albus, Melilotus alba) is native to Europe and was introduced to the North American Continent as a forage crop. It is a member of the pea (Fabaceae) family. Quoting Wikipedia: "It was introduced to North America in the 17th century for cattle forage purposes and is now widespread throughout Canada and the United States, where it has become invasive and can outcompete native plant species." A gangly plant, it can grow up to heights of 2m. 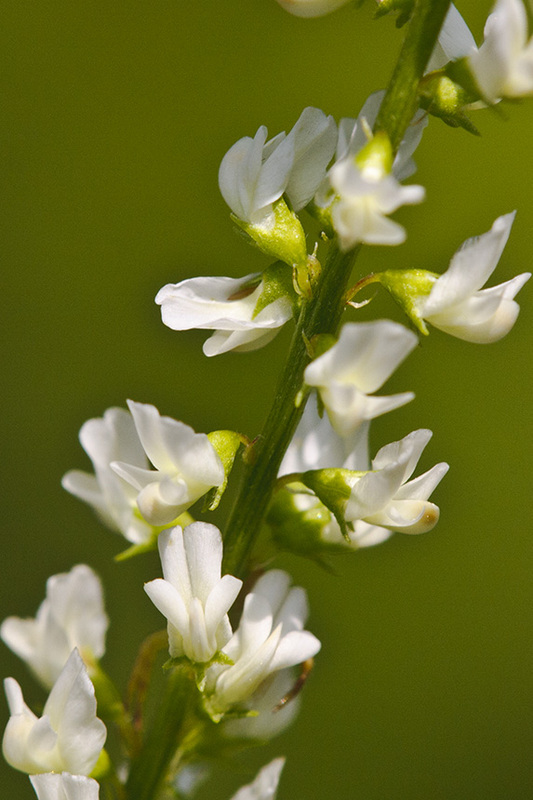 White Sweet-Clover also goes by the names of Bokhara clover, honey clover, tree clover, sweet clover, white-flowered sweet clover, and white melilot. 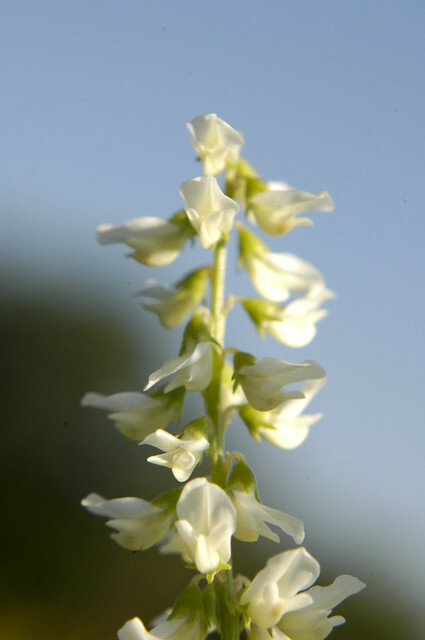 De Witte honingklaver (Melilotus albus) is een plant uit de vlinderbloemenfamilie (Leguminosae).